THERE is a little known place in the Scottish Hebridean islands in the United Kingdom called the Isle of Skye. It is said to have rugged and mountainous landscapes graced with deep lochs. No highrises, no discarded waste. The scarcely scattered white-washed cottages in this place show one how nature has ruled over human creation. But beyond the physical attributes, there is something more to this isle than its landscape. It embodies the epitome of TRUST. One magazine wrote that on the corners where paths cross, there are ‘product boxes’ where people leave their homemade jams and free-range eggs. Passers-by come, take what they need and leave their payment. Doors in homes are left unlocked. One can leave cars there with the windows open, and the only thing that will enter is the rain. This is called integrity. This is called good governance. This is what I envision for our country. This is what I pray that one day every nook and cranny of Malaysia will become and that we do not take what does not belong to us, and we guard and protect with all we have, what is given to us to honour. The example of Isle of Skye is the basis upon which we approached the National Anti-Corruption Plan. It isn’t just a plan, as cynics and critics would say, plucked from the air. The goal of the Plan is to create a corruption-free society governed by the principles of integrity, accountability and transparency. The focus of the Plan is clear — and that is to ensure every agency and ministry in the public sector institutionalises good governance in every part of their work. Why focus on the public sector, one may ask? The answer is simple. If public governance is not strengthened first, we cannot move to ask others to put their houses in order. Prime Minister Tun Dr Mahathir Mohamad launched the Plan on Jan 29. It essentially identifies six key corruption-prone risk areas; political governance, public sector administration, public procurement, legal and judicial, law enforcement, and corporate governance. Again, the process of ascertaining these was done through public surveys, interviews and research. We engaged many components of society — public and private sectors, civil society and the media. The Plan is an amalgamation of information we received from this work and on completion, we had independent anti-corruption specialists review our work. I think it is important that we also understand why we had listed out the nature and points of corruption. 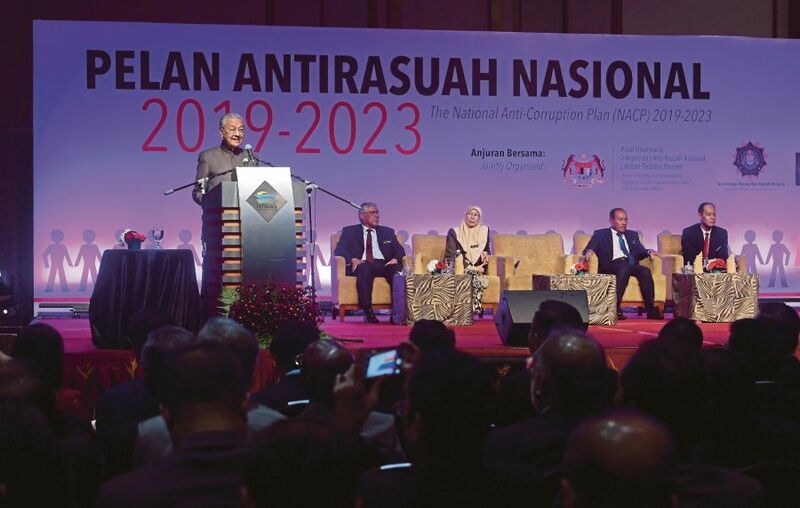 A content analysis of about 20,000 reports received by the Malaysian Anti-Corruption Commission from 2013 to 2018 found that more than 80 per cent were concerned with four causes; administrative failures (36.43 per cent), conflict of interest (33.12 per cent), weak internal control and non-compliance (18.97 per cent), and lack of transparency (6.45 per cent). When we look at the areas prone to corruption from the same data we had, we found that the procurement sector recorded the highest number of complaints (42.8 per cent). That’s why a special section in the Plan focuses on public procurement. Beyond the Plan, our greatest challenge remains, as the government and people of Malaysia, our understanding of the roles of our government, private sector and public. I constantly argue that we have a somewhat warped view of this and frankly we are not alone here in Malaysia. To some, it is almost like watching the movie Matrix. A lot of things in movies like Matrix are used as metaphors for our fixed views of ‘reality’. Rarely do we observe the world for what it is. It is much simpler to build a perceived order, load our preconceptions and baggage onto them to the point it simply becomes conducive and comfortable for us. When we become fixated on a certain world view, and when that world view is simply wrong we open ourselves to the ramifications that come with living a lie, and that is exactly what we are going through today — the bite of reality of having condoned a culture of corruption for decades. I often use the examples of nations such as Somalia, Zimbabwe and Myanmar which all have comparatively high CPI (Corruption Perception Index), coming in at 180, 160 and 132, respectively, to further demonstrate my point. Such positions within the CPI have ultimately left these countries in shambles economically, socially as well as politically. Meanwhile, Malaysia ranks 61 within the index. Admittedly, we are a far cry from achieving the corrupt-free status enjoyed by nations, such as Denmark, New Zealand and Finland, which rank 1, 2 and 3, respectively, on the index. Attitudes and mindsets cannot be measured by Key Performance Indicators. They are intangibles. The real engine to any delivery is mindset. Mindsets are defined by the culture we ultimately inculcate in this system. It is defined by the Isle of Skyes that we each develop in the little areas we are in charge of in our daily lives at work. This culture has to be instilled, has to be imbued and built in every part of our society. That is how we build a place called TRUST.